Professional websites combining appealing design and rich functionality. Custom web applications built according to client specific requirements using the full potential of the latest technologies. Advanced portal development, complex web databases, intranets/extranets, web-enabling legacy applications. Scalable business solutions from enterprise content management to complex business processes automation. Successful Software Web (or Successful Web) is the department of Successful Software that specializes in web development. Successful Web provides professional website design, development and maintenance services. Our skilled web designers and developers accomplish various website projects from brochure sites to multi-functional web portals. We provide complete front-end and back-end development based on the latest technologies and industry trends. "Do I need web site at all?". Mistake No 1: I don’t need website - wrong, everybody needs one especially when dealing with people you do not know directly, international customers and so on. How do you expect prospective customers to find you and get bothe local and international exposure if you do not have a website? Mistake No 2: It is expensive – not with Successful Software Web an expert website development company with competitive pricing. Check our quality services that once were only privilege of large corporations. Mistake No 3: I will do it on my own – forget about it and leave it to professionals. It is not about looks it is about high performance, marketing, design, CMS, SEO,... we will do it all for you. You will have better local and international exposure, less work to do around your internet project, less cost and way to show who you are and what you do to all of your current clients and future leads. Everybody have web sites today but having professionally develop project that is cost efficient, easy to use, with free updates and upgrades is something you need. We are a experienced company offering professional web development. Contact us today so we can help you select best matching between your needs and our packages. We want to make your internet presence easy for you. Many web development companies do not have knowledge and will needed to hold their hands through the process. With Successful Software Web, you will let us know what are your goals, fill in our questionnaire and let us handle the rest. Read below how our websites are different from other website development companies. With the help of modern design tools our designers create appealing, exclusive designs that highlight your uniqueness and let you stand out from the crowd. Irrespective of the website’s functional complexity we aim at keeping interfaces simple and easy-to-use. We pay attention to various aspects to ensure positive user experience. Functionality is what turns your website from a "shop display" into a powerful business tool. By delivering custom-built solutions Successful Web is able to provide the functionality that would completely match your actual business requirements. Modular approach to development allows us to expand the existing or add new functionality easily and cost-effectively when your business requirements change. As a result, you will receive the best return on investment into current solution and decrease your expenditure on future system extension. Depending on your requirements we can integrate different back-office management tools that will give you efficient control over various site operations. This may include non-technical content creation and publishing, dynamic structure generation, document management (incl. images, PDFs, video and audio files, etc), user management, access rights and permissions, business operations management (incl. clients, catalogs, payments, orders, etc. ), site statistics module and others. Our specialists are able to create dynamic, highly interactive and functional websites, making cutting-edge technologies effectively back clean interfaces. We offer our clients a full spectrum of back-end development including dynamic page generation, database design and development (incl. database performance optimization and tuning), distributed database development for websites dealing with large amounts of data, data encryption, advanced search mechanism integration, built-in security, real-time payment processing, audio/video streaming, etc. Throughout the entire website development cycle we will help you define, conceptualize and implement your business web strategy in a cost-effective solution. 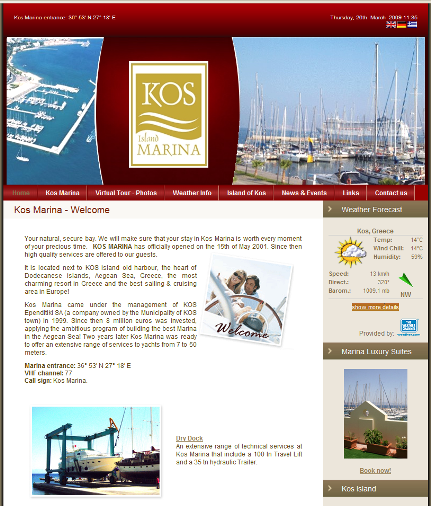 Web site examples: www.kosmarina.gr, www.samosmarina.gr and www.greekislands-yachting.com.